Oh boy oh boy, is it wonderful to have a working freezer and refrigerator again! I've forgotten what it's like to not have all of your popsicles melt into a sugary, sticky mess in your freezer--though it was nice that my ice cream would come out of the freezer immediately soft and ready for scooping. :) Ever since I noticed that my freezer was on its last legs a few months ago (or more than a few months ago--I did spend several months in denial), I've been building up a list of "to-do"s once I had a working freezer again: (1) make ice cream; (2) make ice cream from the Jeni's Splendid Ice Creams at Home book; (3) make peach-flavored ice cream. (See a theme here?) And now: check, check, and check! So of course my first ice cream out of the new freezer had to be peach flavored, and I opted in particular for a summery yellow peach frozen yogurt, with tiny bits of pureed peaches floating inside the tart Greek yogurt creaminess. Peach yogurt is something I learned to love when I was little from my cousin, whose favorite yogurt flavor at the time was peach (I was a vanilla yogurt kid). She would always request peach yogurt whenever my dad went grocery shopping. After she left for college, I switched from vanilla to peach as my go-to yogurt flavor-of-choice, partly out of wanting to be like my cool older cousin and partly out of missing having her around. While I still do very much like vanilla yogurt, I have to say that my cousin had it right all along: the sweet chunkiness of peach is just so perfect next to the tang of yogurt. P.S. The Jeni's frozen yogurt recipe--like her ice cream recipes--is unconventional, but I'm really quite pleased with the results. The tapioca starch-thickened base really helped produce a super creamy frozen yogurt that isn't crumbly or hard, like most homemade froyos. You can find tapioca starch (also know by some companies as "tapioca flour") at well-stocked grocery stores or Asian supermarkets. I would recommend seeking out tapioca starch instead of corn starch (which she mentions in her book) because, as other dessert makers have informed me, corn starch leaves a odd after-texture. 1. Peel and pit the peaches. In a food processor, roughly puree the peaches, leaving very small peach bits in the puree. Measure out ¾ cup (165 g) for peach puree and stir in 3 Tbspn (38 g) of sugar. Set aside. 2. In a small bowl, whisk together 3 Tbspn (43 g) of milk with the tapioca starch to make a slurry. Set aside. 3. In a separate large bowl, whisk the cream cheese until smooth. Set aside. 4. In a medium saucepan, combine the remaining (302 g) milk, (133 g) sugar, and corn syrup. Over medium heat, bring the milk mixture to a boil and let boil for 4 minutes, being very careful not to let the milk boil over. 5. Remove from heat and gradually whisk in the starch mixture. 6. Return the saucepan to medium heat and bring to a boil. Let cook for about 1 minute, until slightly thickened. Remove from heat. 7. Gradually whisk the milk mixture into the cream cheese until smooth. Whisk in the Greek yogurt until smooth, then stir in the peach puree. 8. Cover the yogurt base and chill in the refrigerator for at least 2 hours. Then freeze according to your ice cream maker’s directions. After freezing, let firm in the freezer for at least 4 hours or overnight. 1. In a large bowl, whisk to combine the flour, cream of tartar, baking soda, and salt. Set aside. 2. 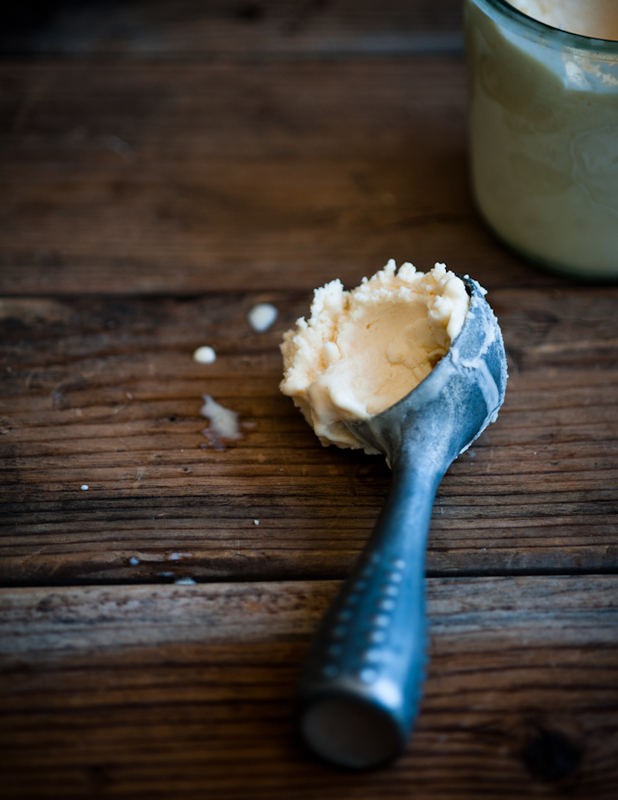 Place the butter, 1½ cups (300 g) sugar, and chopped basil leaves in the bowl of a stand mixer and beat on medium speed until smooth and creamy, about 2 to 3 minutes. 4. Add in the flour mixture, beating on low just until the flour is incorporated. Cover the dough and refrigerate for about 30 minutes, until firm. 5. Preheat the oven to 375° F. Prepare cookie sheets lined with parchment paper or silicon mats. 6. Combine the remaining 2 Tbspn (25 g) sugar and cinnamon in a small bowl. Using about one heaping Tbspn of dough, form a ball and roll the ball in the sugar and cinnamon mixture. 7. Place the dough balls on the cookie sheets, leaving about 2 inches between each cookie. Do not flatten. 8. Bake each sheet of cookies for 10 to 12 minutes, rotating the sheet halfway through the baking time. 9. Remove from the oven and place on a wire rack to let cool briefly. After about 2 or 3 minutes, use a spatula to remove the cookies from the tray. Place the cookies on a wire rack and let cool completely. 9. for assembly. 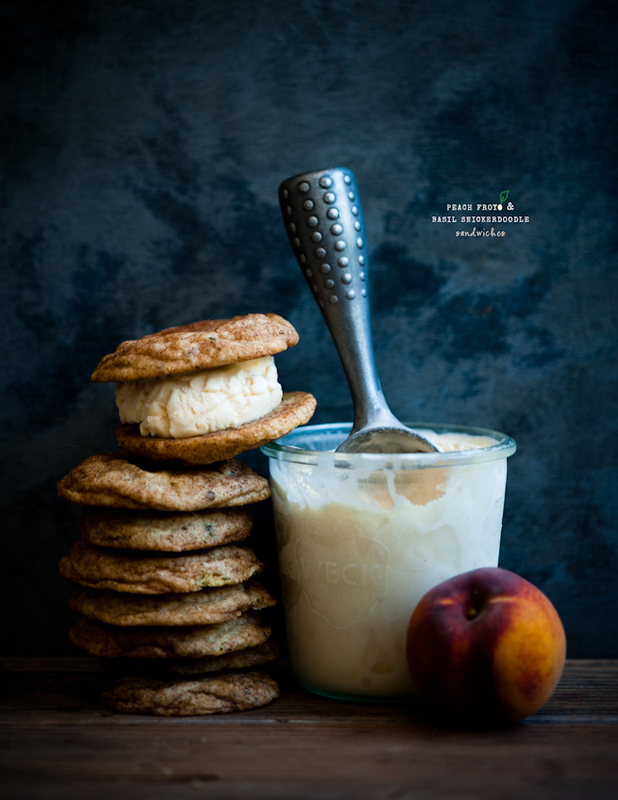 Remove the peach frozen yogurt from the freezer and let soften briefly. 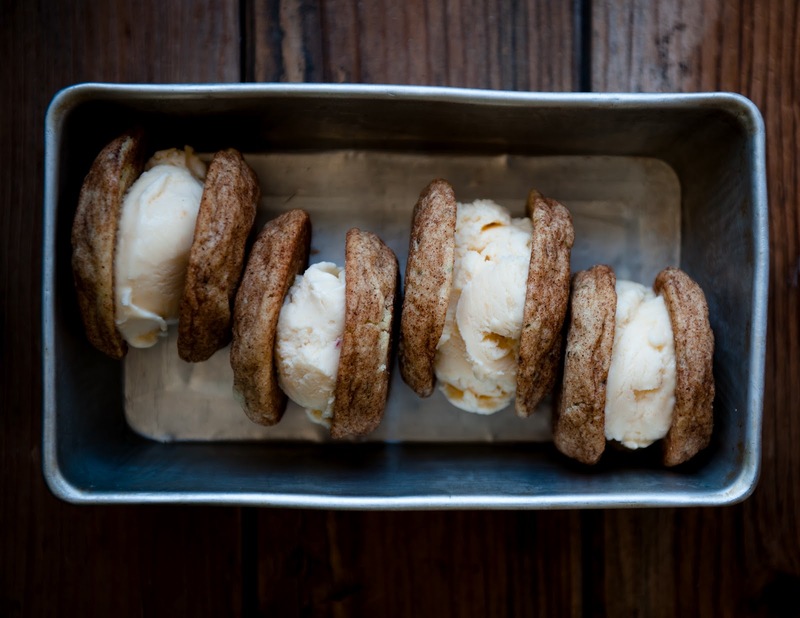 Scoop a spoonful of frozen yogurt onto the bottom of a cookie and top with another, pressing gently. Freeze until firm. Note: I highly recommend seeking out good cinnamon that packs a spicy kick for these cookies because it will make all the difference. Please note that some links in this blogpost are Amazon affiliated, but, per desserts for breakfast policy, I would not be telling you about it if I didn't own/use/love it myself! What an incredibly beautiful dessert. I love a little herbal note in fruity things. I'm so intrigued by the basil-cinnamon combo. Can't wait to try this! delicious post and as usual your images just blow me away! Incredilble! Golly gosh I love your photos. Always a good source of inspiration! Oh and peach froyo sounds amazing. It's in my recipe memory bank when things warm up around here!!! Your photos are masterful! Love love love. And I've been thinking of making something frozen and peachy. Looks delicious. These are gorgeous. 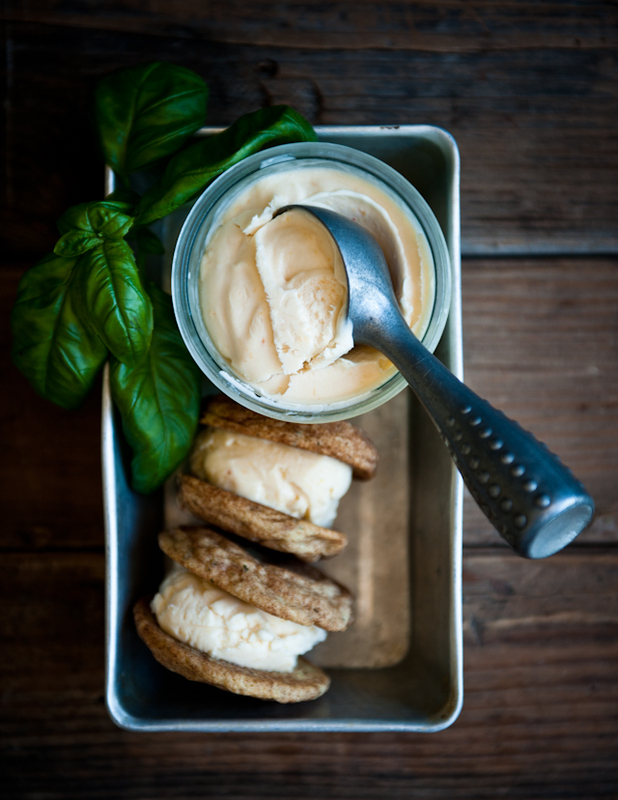 I can't wait until I have an ice cream maker to call my own so that I can make peachy-basil frozen treats! Your photos are so beautiful! That is something I am working on myself. The peach fro-yo sounds great too. Your photography never fails to inspire me. Which reminds me I *really* need to get my hands on a copy of Sated! Herbs + fruit in ice cream is my jam right now. Well herbs in sweets in general. I plan to try this out with a giant basket of peaches from the market & my happily over grown basil plant! oh, if you like herbs in sweets, you definitely need to get a copy of Sated--there's a whole chocolate+herbs article! I was sold as soon as I read "basil snickerdoodle," but that photography is amazing! 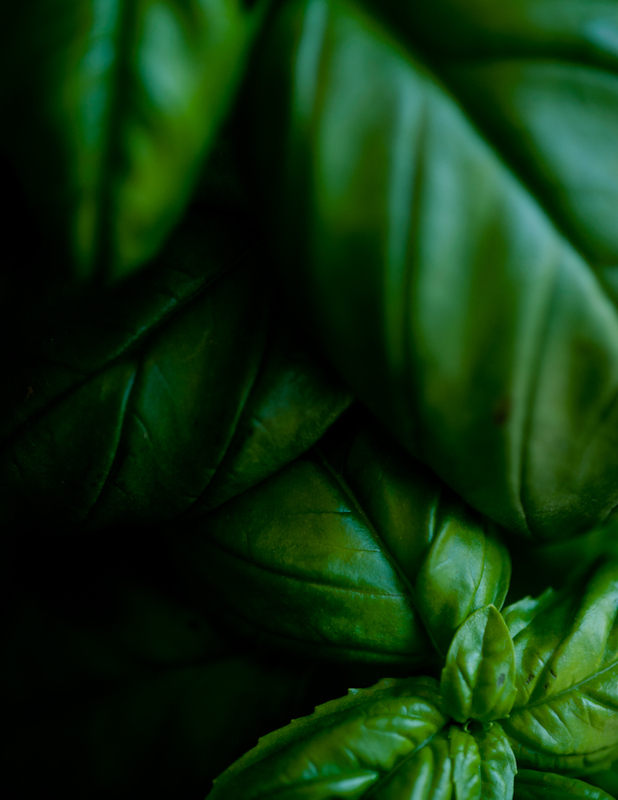 You made even a plain bunch of basil look incredibly delicious. Everything you do is just inspiring and perfect. 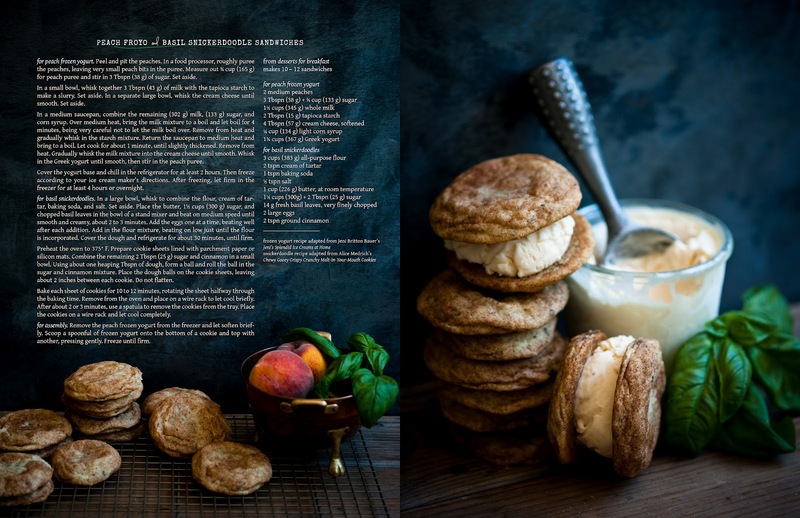 Too beautiful.Absolutely adore these images and the recipe. 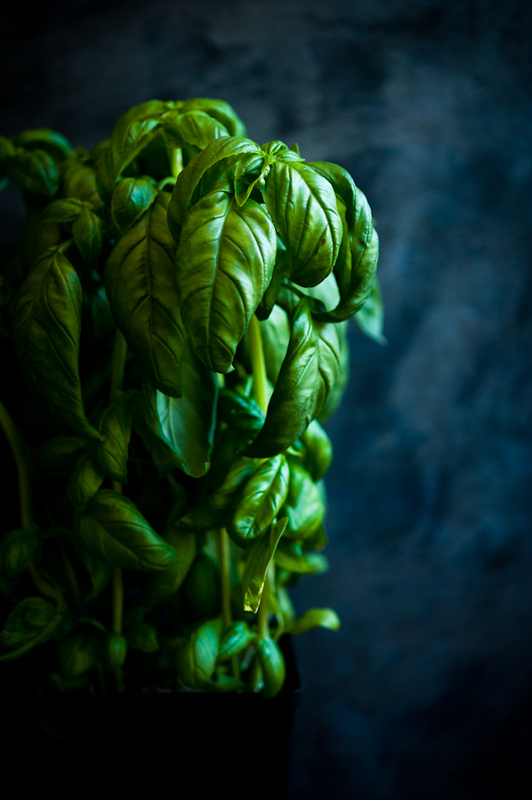 Basil is love. 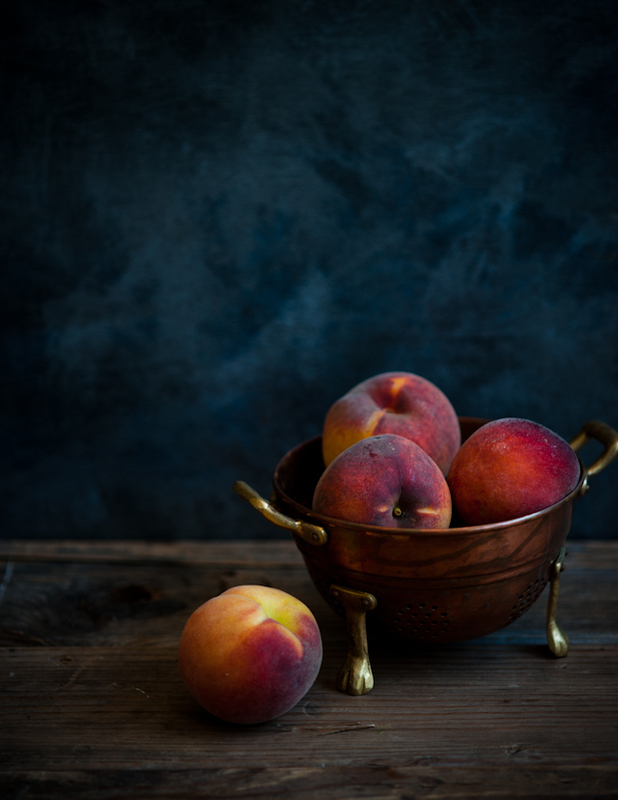 I've never tried peach frozen yogurt before--it sounds great! Plus that whole snickerdoodley basil addition sounds even more delicious! Such a great flavour combo! Yum. Your photos are absolutely stunning..I hope I get as good with my food pics one day. just discovered your blog. YUMMMMMM. I want to eat the page. Amazing photos.